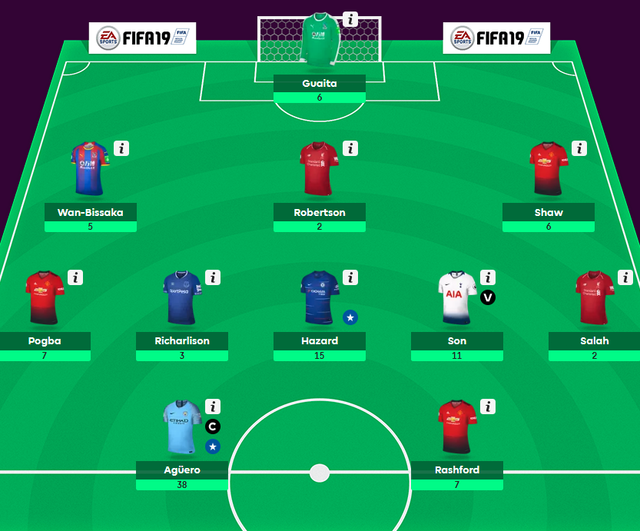 A double gameweek for two teams and an average score of 65 made the latest round of fantasy football a high-scoring contest. Joel Tesfai leads the way in the AFC Bournemouth fan league after an impressive gameweek score of 102 points. At the back, clean sheets for Luke Shaw and Aaron Wan-Bissaka saw the defence perform well, while the combination of Heung-Min Son and Eden Hazard in midfield, both of whom picked up double figures, helped make it a week to remember. Up top, Marcus Rashford’s winner against Leicester saw him total seven, with Manchester City counterpart Sergio Aguero bagging 38 points after Joel’s decision to captain the Argentine, who netted a hat-trick against Arsenal. An impressive week leaves Joel 60 points ahead of second place in the AFC Bournemouth fan league, as Gurbanmyrat Myradov looks to close the gap ahead of him. He also enjoyed a successful gameweek, finishing with a score of 85. Ben Foster kept a clean sheet in goal and was also awarded a bonus point, meaning he finished on eight. Further up the field, Raheem Sterling was chosen as captain and bagged 22 points across his double gameweek, with Hazard again proving a popular choice. Up front, Raul Jiminez, alongside Rashford, was the difference after his goal and three bonus points saw Gurbanmyrat finish on 85 for the week. However, beating both leaders in the AFC Bournemouth fan league across gameweek 25 was Yo Fowler-Wright, who top scored with an incredible 147 points. The decision to triple captain Aguero certainly paid off, with the striker totalling 57 points as a result. Yet it was also a successful week the back, as David Luiz’s goal against Huddersfield and Aymeric Laporte’s header last night saw the two defenders bag 32 points between them. Hazard and Sterling duly delivered in midfield too, making it a fine week for Gurbanmyrat.